The relationship between species richness and elevation is a hot issue in ecology and has been documented extensively. It is widely accepted that area size can significantly affect this relationship and thus mask the effects of other predictors. Despite the importance of the relationship between species richness and elevation while accounting for the area effect, it is insufficiently studied. Here, we evaluated area-corrected species richness patterns of all vascular plants as well as six vascular plant subgroups (seed plants, ferns, trees, shrubs, herbs and vines) along a tropical elevational gradient (Hainan Island, China). 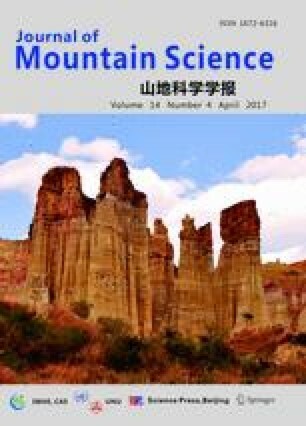 If assessed in equal-elevation bands, uncorrected species richness showed bell-shaped curves, while area-corrected species richness assessed in equal-area bands appeared to increase monotonically due to the small proportion of highlands on Hainan Island. The mid-domain effect (MDE) was significantly correlated with both uncorrected and area-corrected species richness. On Hainan Island, the use of equal-area elevational bands increased the explanatory power of MDE. These findings provide useful insights to adjust for the area effect and highligh t the need to use equalarea bands along the elevational gradient. Supplementary material (Appendixes 1-12) is available in the online version of this article at http://dx.doi.org/ 10.1007/s11629-016-3894-6. We acknowledge with great appreciation the support provided by the National Special Water Programs (Grant Nos. 2009ZX07210-009, 2015ZX07203-011, 2015ZX07204-007), the Department of Environmental Protection of Shandong Province (SDHBPJ-ZB-08), the China Scholarship Council (Grant No. 201306730020), the Chinese Natural Science Foundation (Grant No. 39560023), and Queen Mary University of London. Supplementary material, approximately 1297 KB.